Atom Egoyan is an atypical director, in the sense that two widely conflicting influences are to be found in his cinema. On the one hand, there is a very Canadian feel to his films, cold, detached and contemplative, often featuring empty and soulless places, which I am very fond of. But then it is intriguingly weaved in with his warmer Armenian and Egyptian roots, found in the Arabic and bewitching scores of his films, their political subtext, and more Old World underlying passions. 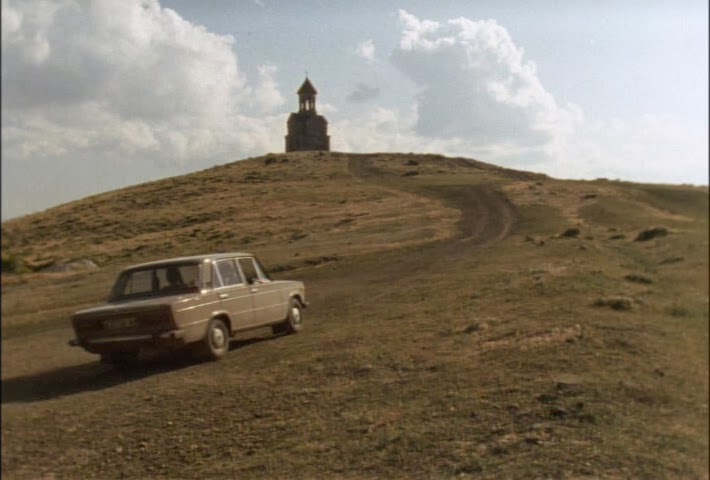 In Calendar (1993), a road-move of sorts, we follow a couple's journey around Armenia through the eye of their handheld camera, as they take pictures of churches for a calendar, and see their relationship slowly disintegrate. These scenes are intertwined with some strange and repetitive ones in which the man, months or even years later as we guess), sets up the same scenario over and over again, in which foreign women have dinner at his before taking on a phone call in their native language. This inconspicuous routine is somehow linked to his earlier and fateful journey, as we later find out. Atom Egoyan's usual theme of voyeurism is very much present here, a voyeurism which is always linked to technology, as the viewer becomes the forced and unsuspecting witness of a crumbling romance, through some very personal and intimate video footage. Technology always has a place in the director's film, but as usual with him, far from bringing his characters together, its creates nothing more than distance. And his predilection for fractured and multi-stranded stories is also very much in evidence, a narrative tool he was so keen on in the 90's and used to such great effect in later films. This pretty much feels like an experiment, in which Atom Egoyan tried to rekindle with his Armenian roots, one that, while not always relentlessly entertaining to be polite (despite its short running time), is an interesting one nevertheless. The director himself will readily admit that the final product is not what he was hoping for, due to financial and time constraints. But all the same, this belongs to the eve of his golden age that was to last until Adoration before he lost his ways recently. His touch and unique style are in abundance in here, making it a must-see for his most completist fans, not to mention the presence of his always fascinating muse Arsinée Khanjian. Calendar was recently rereleased by Artificial Eye in DVD and Blu-Ray.